Intensity of hostile attacks in the combat zone decreases almost twice compared to the previous day. Avdiivka’s industrial zone as well as the area between Chermalyk and Shyrokyne in Mariupol sector stand as hotspots. Ukrainian troops incurred no lethal casualties in the combat zone over the last day, four servicemen were wounded in action. It was reported by Colonel Andriy Lysenko, spokesperson of the Ministry of Defense of Ukraine on ATO-related issues at a press-briefing at Ukraine Crisis Media Center. In the Donetsk sector militant groups mortared Avdiivka’s industrial zone. “The enemy opened fire in the area of Avdiivka. Along with heavy weapons, mortars and tanks in particularly, militants were also using light weapons. In Kamyanka – Avdiivka’s left flank, the adversary was active only in the morning. 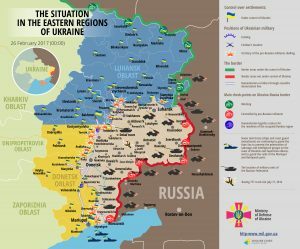 They fired 20 mortar mines and five tank shells,” elaborated ATO spokesperson. Russia-backed militants fired from tanks upon Ukrainian positions in Pisky. Sporadic attacks upon Ukrainian positions took place at the Svitlodarsk bulge, in Zaitseve, Kirove and Verkhnyotoretske. Heavy weapons were not used in this area. There were 23 militant attacks in total in the Donetsk sector over the last day, 10 of them included the use of heavy weapons. In the Luhansk sector militant groups violated ceasefire in Troyitske, around Bakhmutska road and in Stanytsia Luhanska. Mortar attacks were registered in Popasnyansky area and in Novotoshkivske. Ukrainian troops registered a total of five attacks upon their positions in the Luhansk sector over the last day. In the Mariupol sector, combat actions took place only between Chermalyk and Shyrokyne. “In this area the enemy was violating ceasefire incessantly over the day. Most tense situation was observed in Hnutove, where militants held a massive mortar attack between 12 noon and 2pm, and were also firing from grenade launchers and small arms. In the second half of the day Russia-backed militant groups fired upon Ukrainian positions from tanks. One hostile mortar attack was registered in Chermalyk. Mariupol sector accounts for a total of 21 hostile attacks over the last day, three of them included the use of heavy weapons,” Colonel Lysenko said. Report on the military developments as of February 25 is available here. Interactive data on the shelling: chronology shelling chart and the interactive map.